The press announcement for Mr. Tom Dixon’s upcoming trip has an appropriately catchy headline: ‘Around the World In 90 Days’, but the designer himself anticipates that he will be on the road all year moving from Amsterdam to Reykjavik, from New York to Hong Kong, Vancouver, Nashville, and Casablanca. He plans to go to Dakar in Senegal, where he has never been before, and also to Lima, Peru to finish off the journey. In March, he spent a couple of days here in Singapore to visit furniture retailer Xtra, where his collections are sold, as well as to participate in an international design colloquium. “It’s an excuse to go to a couple of places I’ve not been to,” he says in half jest. In reality, although the world tour sounds like a leisurely trip across the globe in a hot air balloon, his work calendar is packed. This month the London headquarters, which has a restaurant, a shop, and about 100 people, will move to a new address. In May, it will be New York’s turn; a temporary shop has to be set up. “That’s gonna be a huge burden in terms of capabilities,” Mr. Dixon remarks. Mr. Dixon’s holds a theory that in the modern world one’s power does not reside in New York or London, but in one’s network. “If you look at where we sell and the people who have been the most enthusiastic and the most supportive over the years—it would be nice to reward them or at least pick up the conversation again rather than being centrally focused on just going to Milan like everybody else. Parts of Mr. Dixon’s itinerary are obviously ‘usual-suspect destinations’: Cape Town in South Africa and Singapore in Asia, for example. But Reykjavik, Tennessee, and Casablanca are specifically unusual. “I’ve never really designed with the attitude that an object will look good in a certain place. My design comes from me learning to become a designer or learning how a structure can stay up. The chair, table and candlestick came from the time I moved away from all the scrap metal to virgin metal as it were. It comes from me trying to figure out the minimum use of materials to make a table or a chair stand up, and improving my welding technique as well. "I was poverty-stricken at one time and metal was precious – these were made of welding rods for a gas welding machine – so it’s partly practice. I was also teaching a lot of kids to weld at the time. Mr. Dixon, meanwhile, designs for Tom Dixon. The company has an interior design department that does work for exterior partners, but over the past 15 years, Mr. Dixon reveals that they have not done any. Some designs from Mr. Dixon’s previous career are still being manufactured, and there are few things that they have decided to do tactically, like the collaboration with IKEA that has just been launched. 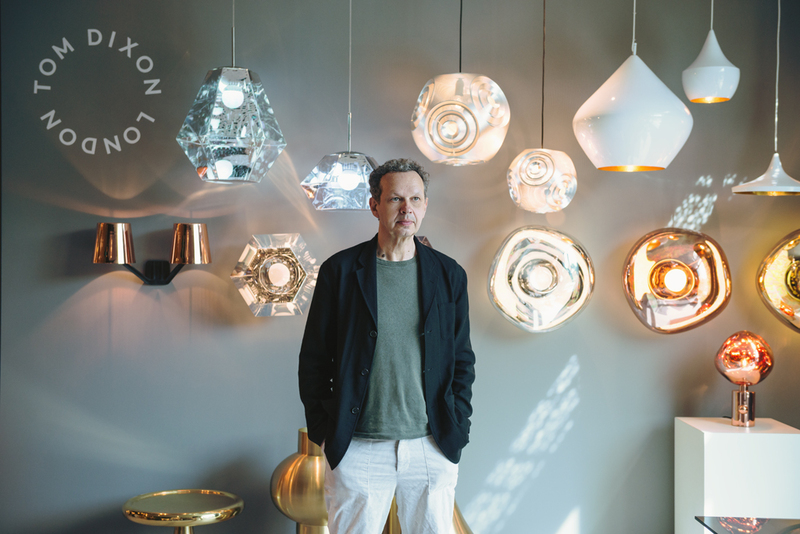 Tom Dixon counts several successful designs in all its ranges, the number of copies of its designs a testament to their popularity. “I’ve noted that when the objects are successful – and not everything becomes successful – they tend to be the ones that can be read, where you can imprint a bit of your own whatever onto it,” Mr. Dixon says. “I may have come from a completely different perspective; those specifically came from a visit to some metal workers in Northern India,” he says pointing to his pendant lamps, “that make water pots so the shapes have come from that. “But when people read my CV, they see North Africa (he was born in Tunisia), they decide ‘that’s definitely a North African influence’, but it’s not. Some of my designs have been successful because they’re legible in several different ways. It could be Arts & Craft, right?” he asks, referring to the same lamps. Mr. Dixon would like to think that there’s a bit of history in his designs. “I’m not inventing anything really – it’s not an inventing game; it’s a reshaping game. There’s a lot of references to Pop Art, Abstract Expressionism, and even Victorian engineering – all kinds of stuff. I guess those references get lost in the process of shape making. “Same with this piece,” he says of an object he’s designed. “Some people say it’s very organic, very natural, that they are reminded of a volcano, but some other people would say, ‘Oh, my god, that’s so Space Age, so 1960s retro. That’s often the success of an object; they also tend to have longevity. If an object is too specific they will get out of fashion quickly. That’s a post-rationalization; I don’t know if it’s true. “I don’t know if somebody can have 100 per cent hit – apart from Taylor Swift,” he laughs.